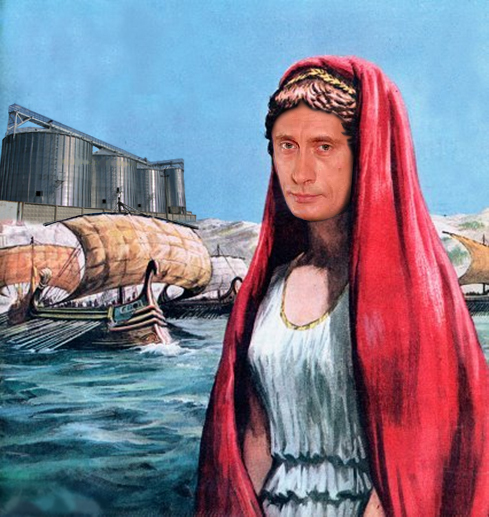 A fleet of between 200 and 1,000 vessels will be required to carry newly released Russian wheat and other grains to markets in the Mediterranean and East Asia, grain traders and port sources have told Fairplay, in the wake of the May 28 order from Prime Minister Vladimir Putin. Putin stole the thunder of other officials, announcing that the grain export embargo, due for extension or termination next month, will be lifted, and exports resume from July 1. Russia is the world’s third largest grain exporter, but has been off the market since severe drought last year cut the harvest by one-third, triggering the export ban between August 15 and December 31. The ban was then extended to July 1 to allow time for the spring harvest to be estimated. This now appears to be headed towards a total of between 85 and 90 million tonnes. Allowing for domestic consumption needs and state reserves to control price inflation, the new figures suggest that export volumes may reach between 10 and 20 million tonnes. At a specially arranged press opportunity last Saturday, Putin told the deputy prime minister in charge of agriculture, Victor Zubkov, “to control the grain market after harvesting is completed.” Zubkov replied that the government is holding 6 million tonnes of intervention grain stocks, available for release if domestic prices rise sharply. In addition, Zubkov promised that “if prices begin to grow, we can begin to apply customs and tariff regulations measures.” Industry sources told Fairplay these measures refer to penalty export duties if the required volumes for feeding domestic consumption are depleted by higher-priced foreign sales; and may also include volume quotas for designated exporters. Alexander Korbut, spokesman for the Russian Grain Union, the traders’ association, told Fairplay the two leading port outlets for grain, Novorossiysk and Tuapse (Black Sea), can load vessels with capacity from 25,000 t to 55,000 tonnes at a time. On the Azov Sea, the ports of Azov, Rostov and Yeisk usually load bulkers of up to 5,000 deadweight tonnes. “Exports will certainly boom starting July 1, with some companies rushing to the ports,” Korbut said, adding: “no serious logistical problems are expected, if permanent grain exports are allowed”. Rail congestion on the approaches to Novorossiysk have been common the past; they trigger diversion of cargoes to the Azov Sea ports. Competition for the shipping consignments is fierce, and trade sources in Moscow claim no shipping company dominates the market. Victor Krupenin, spokesman for the United Grain Company (Russian abbreviation OZK), the rising state-owned grain trader, estimates grain shipment capacities for the main sea outlets to benefit from the lifting of the embargo as follows: Novorossiysk, 8-10 million tonnes; Rostov-on-Don, 2.5-3 million tonnes; Tuapse, 2.5 million tonnes; Azov, up to 2 million tonnes, and Yeisk, from 1 to 1.5 million tonnes. He noted that grain terminals are also likely to ship export grain after July at Kalach-on-Don, Temryuk, and Taman. Worst hit by the embargo has been Novorossiysk port. Latest cargo volumes released this week show that a year ago, the port shipped 3 million tonnes in the four-month interval, January 1-April 30; this year, the total was almost zero. In 2009, when Russian grain exports were at their peak, Novorossiysk shipped a record 9.1 million tonnes. Egypt was the biggest recipient of shipments from Novorossiysk, followed by Turkey, Saudi Arabia, Syria, Pakistan, Azerbaijan, and Bangladesh. Tuapse has a new grain shipping terminal with capacity to load 2.4 million tonnes per annum. The port company is part owned by Universal Cargo Logistics, a Dutch-registered holding owned by Russian oligarch, Vladimir Lisin. The Novorossiysk port company was taken over in January by Transneft, the Russian oil pipeline company and an investor syndicate fronted by the newly elected chairman of the port company board, Ziyavutdin Magomedov.